For the past several weeks, Google has been actively leveraging its Google Hangout feature more and more to share insights of today’s thought leaders with the world. Later this month, Google Play, in collaboration with Google in Education, is set to have Salman Khan, the founder of the popular “learn-it-yourself” service, Khan Academy, take part in a Google Hangout to talk about his new book The One World Schoolhouse: Education Reimagined. The timing of this event is anything but coincidence. Just a couple of weeks ago, Khan and Google announced that the two companies were teaming up to develop a new competition to find the next generation of “educational YouTube stars”. The hope is that they’ll be able to find the Next EDU Gurus which will help evolve the way education is given in the country, and in the world. All those interested in submitting an application had until October 1 to do so. Those selected to participate in this event will attend a three-day workshop at Google around the same time as this Google Hangout. For Google, its education arm has been putting a lot of effort into helping improve the tools that teachers and educators have at their disposal. Earlier today, it announced that as part of World Teachers’ Day, it has made some remarkable in-roads into helping foster higher education around the world: 400+ universities are utilizing YouTube Edu to host lectures and full courses; the majority of Ivy League universities and most of the top 100 US universities are using Google Apps for Education; and over 500 schools and districts are using Chromebooks this fall. And now, this month’s Google Hangout with Khan will allow the search engine giant to promote another way of learning to the world — and demonstrate that your education doesn’t have to stop once you graduate from high school or college. Khan will speak about his new book The One World Schoolhouse and explain why he believes that everyone deserves a world-class education and how it can be achieved in a less-costly way. 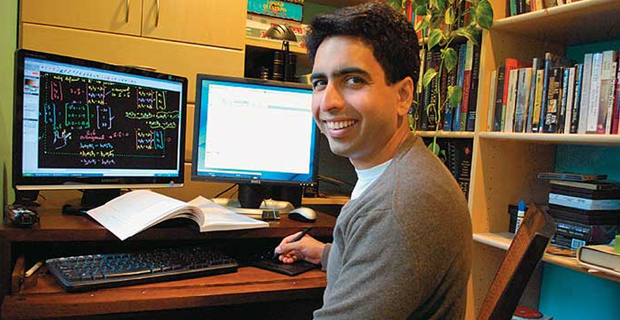 His point and the goal of the Khan Academy? One must not worry about costs in order to get an education, just that there are resources out there to help you learn. And today, millions of students, parents, and teachers around the world use his startup’s videos and software to increase their knowledge. After the presentation, Khan will be accepting questions from the audience. Google is giving people a chance to be part of the live hangout on air. Simply submit a 30-second video of yourself asking Khan a question, upload it to YouTube, and use the hashtag #khanhangout. Then fill out the submission form. A maximum of nine people will be selected (a standard Hangout has 10 people). The exciting Google Hangout begins on October 17 at 1pm.